I have had the pumpkin cheeze sauce from Oh She Glows in my to do recipe pile for awhile now. I finally got around to it and was not let down! It is really creamy and satisfying. I did not really get a pumpkin taste, the nutritional yeast does come into play though. I was hesitant to give it to Matt because well, it's pumpkin based and he is often odd about things like this. He liked it though and he said it went well with the broccoli. I also made baked tofu from Appetite For Reduction - since I am trying to cook along with the cook book challenge over on the PPK. The broccoli is easy. Take a few cups of broccoli heads, steam in a pan with a lid and a few drops of water, till the water is gone ( a few minutes) on low heat. Add a bit of lemon olive oil to the pan, a squeeze of fresh lemon juice, a pinch of S&P and a nice sized pinch of red pepper flakes. Toss and cook for 2-3 minutes and serve! This is a pretty fast meal - one of those 30 minute meals, if you do not count the tofu marinating for a hour. However that is down time and does that really count? 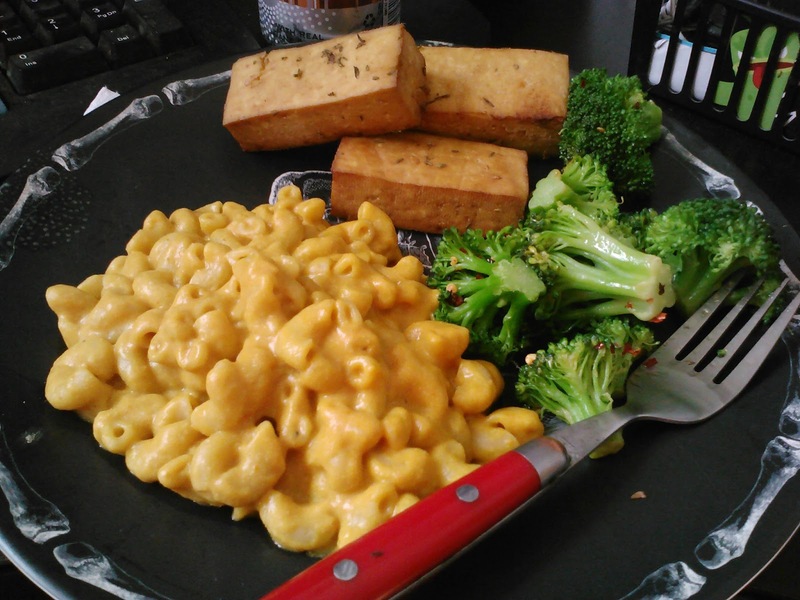 Mac & cheese with tofu & broc is one of my favourite ever meals! So delicious!